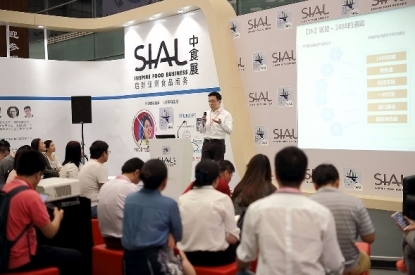 SIAL China, Asia’s largest food innovation exhibition, closed its door on 7 May recording a further increase in the level of internationality on both the exhibitors and visitors side. Altogether, 2,942 exhibitors (+ 7.6% vs 2015) presented their latest products and food trends from 67 countries all over the world, 30 provinces and over 76,986* visits (+25.6% vs 2015). This year’s SIAL CHINA took place on 126,500 square meters of exhibition space compared to 115,000 square meters last year. SIAL China’s dedication to “look deeper” comes true with a significant breakthrough point in Asia. 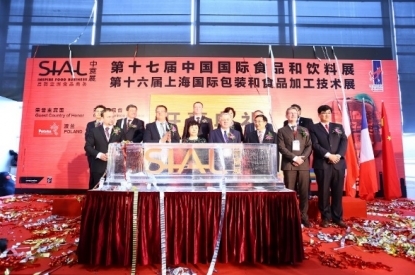 On 5 May, a delegation of ministers (Czech, Belarus, Poland and Russia), ambassadors, consuls and trade officers participated to the Opening Ceremony of SIAL China 2016. Shandong province, Vice Chairman of General Chamber of Commerce of China, Deputy Secretary General of China Association of Aquatic Circulation and Processing, Secretary General of Cold chain logistics specialist committee. The guest country of Honor - Poland, was represented by Minister of Ministry of Agriculture and Rural Development of the Republic of Poland and Ambassador of Embassy of Poland. Without forgetting Minister of Agriculture of the Czech Republic, Minister of Ministry of Agriculture and Food of the Republic of Belarus, both Minister and Deputy Minister of Ministry of Agriculture of the Russian Federation, Vice Minister of Ministry of Agriculture Lithuania; Governors and Vice Governor from Argentina Provinces; and Ambassadors and Consul Generals of Costa Rica, Czech, Poland, Indonesia, Latvia, Lithuania, Tunisia, Uruguay, Argentina, Belarus, Bulgaria, Canada, Colombia, Cuba, Ecuador, Egypt, Estonia, Greece, Ireland, Mexico, Norway, Portugal, Russia, South Africa, Sweden, Thailand, Turkey, Uruguay, Ukraine and many more. Prior to Poland’s participation in 2016, they have always been working closely with SIAL CHINA to boost the Polish-Sino food and agricultural trade for years. In 2016, Poland pavilion joined as Guest Country of Honor and showcased a strong representation of good-tasting Polish food and drinks. With Gansu’s halal foods, aquatic products and other organic foods in hall E4 and its wines in hall W5, Gansu provincial pavilion came to SIAL CHINA 2016 as the Guest Province of Honor. The jewelry on the crown of SIAL Network - SIAL Innovation took off its veil from day 1. 151 innovative products were selected by an independent jury displayed great experience and commitment, of which 10 were further rated as the finalist products for their contributions to innovate pleasure, health, physical, convenience and ethics for food product. These 10 products all touched on development that are important to Asian food industry. This year the Gold Award went to ISOLINE TRADE, S.R.O. from Czech for its Trojka drink; the Silver Award was awarded to EGNIS INC.from Korea for its Lab Nosh; the Bronze Awardwent to JUST WATER INTERNATIONAL LTD from New Zealand for its Elite Manuka Honey Water! SIAL Innovation Grand Award has long since been considered as the guide for most edge-cutting products exhibited at SIALs. Right after the unveiling of winner list, the stand of our Gold Award winner were inundated with distributors and importers requesting for business cooperation. La Cuisine was endorsed by World Association of Chefs Societies (WACS) for its 3rd year and organized 8 teams from Austria, Korea, Malaysia, Singapore, Beijing, Shanghai, Guangzhou and Dalian to compete for the champion. Each team consisted of 3 highly-skilled chefs and was required to complete themed dishes on-site. After 2 rounds of multiple themes such as “health” and “organic”, the Dalian team topped all the other teams and won the honor of “Top Chef” with great acclaim. Meanwhile our Guest Country of Honor Poland, presented the cooking demonstrations with their quality food and ingredients at La Cuisine. In partnership with Sinmei, the 5th edition of Retail & Hospitality Forum sparked with the intuitive insights and accurate analysis that share by our all-star speakers. The world’s largest online and mobile marketplace Alibaba, world leading consumer product company Suntory Brewery, consultants and experts from The United Nations Office for Project Services and Euro Monitor and many more delivered speeches on the latest hot topics including food sustainability, import and export policy, food innovation, HoReCa and market trends. In the meantime, we recorded the full panel discussion as well as the conference which will be shared on its online channel YouKu.com. Please stay tune for the online presentation updates. In the 2016 edition, World Tour helped all the exhibitors and visitors to understand the specific characteristics of the food market by geographic area. 28 billboards featured best-selling products and the information to define the retail strategies, from Australia to Canada, from Brazil to Russia, the United States, India and China were all displayed. In addition, a list of top 10 retailers and top 5 retail trends were also displayed to identify consumption drivers. As soon as the first speaker opened the forum on 5 May, this event became the spotlight in the wine sector. Mr. Tim Wildman MW joined us this year as the Keynote Speaker and led a star studded line-up including Mr. Kenichi Ohashi MW, Sommelier Nikhil Agarwal and many more. 15 sessions were held and gathered 900 people on-site. In additionally the 2016 edition brought more wines from the emerging New World such as Japan, India and Russia with a blend of maturity and freshness. Wine Innovation Forum once again brought new perspectives to wine audience on its understanding of the wine business! In partnership with WINE100 - one of the most professional and influential wine rating agencies in China, Best Buy China Competition brought an effective platform to showcase exhibitors’ star products. On 5 May, a panel of 8 judges including: trade buyers, wine educators and MW had performed a blind tasting of the wines & spirits submitted by SIAL CHINA 2016 wine exhibitors. The Jury was presided by Tim WILDMAN MW. This year, 40 exhibitors submitted their wines for Best Buy China Competition. 10 Best Buy, 7 Honor Awards were awarded. In the presence of Mr. Nicolas TRENTESAUX - Managing Director SIAL Network, Mr. Lukasz Holubowski - President of Agricultural Market Agency Poland, Mr. Tim WILDMAN – MW and all the VIPs of SIAL, the awards ceremony took place on 6 May during After SIAL Party. More than 400 officials, VIPs and exhibitors from the industry attended the ceremony, witnessing the long-awaited winner list for Best Buy China Competition. As a central place for wine experts and wine lovers to converge together, Master Classes are dedicated with tasting room helping wine lovers to cultivate their tastes for premium wines. Presented by Gansu Wine Bureau, EaseScents, DSW and so forth, 8 tasting and education sessions were conducted with many intriguing topics such as “Yellow Wine Lecture – Pagoda Brand Handcraft Wine”, “New era of the Imported Wine”, “Development of Chinese Wine” and many more. Around 500 professionals participated to those 8 sessions to interact with the masters during 3 days. Endorsed by Café Culture and Australasian Specialty Tea Association (AASTA), this event honored traditions with brewing skills and carry on tea innovations by organizing competitions. For the second edition and after 3 days contest, Mr. Wei Chuwei the 2nd prize winner of last edition returned in 2016 stood out and beat all the other 31 contestants. Ms. Fang Zhenzhen won the 2nd prize and Mr. Shen Guohui ranked the 3rd. 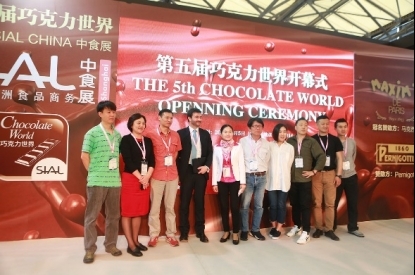 The 5th edition of Chocolate World saw 7 sessions successfully held within 3 days. The former engaged top dessert chefs from 5 five-star hotels including Renaissance Beijing, Crowne Plaza Park View Wuzhou, The Opposite House and many more. Main sponsors, MAXIMS & Pernigotti brought incredible shows on-site. MAXIMS’ tailor-made chocolate drama pushed forward the happiness that generated by the fantastic taste of desserts. Mr. Zhou Liqun from Beijing Hospitality Institute won Best Performance. Mr. Du Huiping, an amateur dessert lover was awarded Best Creativity whilst Honorary Award went to Mr. Zheng Tao from Renaissance Beijing. Mr. Li Dong from The Opposite House was the winner of Best Popularity. The Fourth edition of Seafood Fest’ – Right Seafood Right Wine was held together by China Aquatic Products Processing and Marketing Alliance (CAPPMA) and Marine Stewardship Council (MSC). With sessions dedicated to introduce the “right seafood” associate with “right wines”, Seafood Fest’s exalted the palate with gourmet food products. In addition, CAPPMY & MSC hosted an event jointly themed "MSC sustainable selection--trace to the source of seafood to the fishery" promoting sustainable seafood. Besides focus on promoting GFC Rock Lobster as a representative seafood from western Australia, other seafood from ZHANGZIDAO GROUP, DALIAN RICH SEAFOOD CO., LTD. , DALIAN FISHING BEAUTY FOODSTUFF CO.,LTD. also exhibited during the event. MSC introduces the aim and market development of international sustainable seafood. SIAL CHINA inaugurated its collaboration with Shanghai Entry-Exit Inspection and Quarantine Bureau (Shanghai CIQ) to organize a dedicated panel discussing the matter of food producers supplying quality food that meets HACCP international standards for both domestic and overseas markets. As a unique opportunity to engage with Shanghai CIQ where both private and public sector representatives came together to form the panel. This forum became the spotlight that attracted by 250 private and public sector representatives. On 6 May, After SIAL Party returned to cruise Caption 5 along the Huang Pu River in Pearl of the Orient Shanghai. With a fantastic combination of selected wines, gourmet food and rivera view, over 400 VIP exhibitors and VIP buyers celebrated the great success of SIAL CHINA! 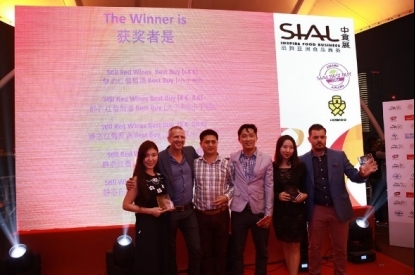 In additionally, the awarding ceremony of SIAL – Best Buy China Competition also came on board. Adding to the food exhibition and events, there are in total 30,685 attempts of booking match-making meetings involving 2,702 exhibitors and 8,520 visitors. In the end, 2,019 meetings were successfully booked online. With over 20% increase in the number of visitors, SIAL CHINA boomed Asia’s food and beverage market with a resounding success. SIAL CHINA truly lives up to its expectation as Asia’s largest food innovation exhibition that leverages the food trade between Asia and the rest of world more over the number. Next year, SIAL CHINA will be held from 18 to 20 May 2017. Please stay tuned with us and “look even deeper” for new market drivers and innovations for the next year.